In a bit of a PR coup (or embarrassment), Peugeot claim they have used their recently unveiled EX1 Concept electric car to set 6 FIA Acceleration World Land Speed Records for battery powered electric vehicles. The numbers they've released aren't very impressive so we thought we'd investigate. Eighth-mile: 8.89 seconds, 50.61 mph. Quarter mile: 14.40 seconds, 62.4 mph. 500 meters: 16.81 seconds, 66.5 mph. Half-mile: 23.85 seconds, 75.46 mph. 1,000 meters: 28.16 seconds, 79.428 mph. One mile: 41.09 seconds, 87.6 mph. Now, a standing 1/4 mile in 14.4 seconds for an Electric Sports car isn't going to impress anyone when a road registered Tesla Roadster can do the same in 11.45. Britain's Whatcar magazine are reporting the 340 hp AWD EX1 will do 0-62mph in 3.58 sec, and 6.6 seconds to reach it's top speed of 162 mph. The speed records set simply don't show any relation to that kind of performance yet no one at Whatcar or Wired seems to have noticed. It took 8.89 seconds for the EX1 to cover an 1/8th of a mile and reach 50 mph. If it has the performance Peugeot claim the should have been well on it's way to it's claimed top speed of 162 mph by the 1/4 mile timing marker. In fact, it's fairly suspicious that the car doesn't manage to reach it's claimed top speed even after accelerating at maximum power for a full mile! The FIA land speed records are divided into three weight classes. Class 1 being for vehicles less than 500 kg, class 2 under 1000 kg and class 3 being for EVs over 1000 kg. With a claimed gross weight of 750 kg (very impressive considering it's supposedly carrying a 30 kWh battery that probably weighs around 250 kg) The Peugeot fits into class 2. The records in this class have been sitting on the shelf since 1971 just begging to be broken. Set at the Hockenheim circuit by George Von Opel almost 40 years ago, driving an Opel GT converted to Electric, his name is on 5 speed records in the sub 1000 kg battery powered EV class. A record of 55 mph after a 1/4 mile isn't much of a challenge and the French team have only managed to move the goal posts to 62.4 mph. With road registered EVs like the Datsun 1200 White Zombie routinely doing 10.258 @ 123.79 mph over the 1/4 we don't think the new Peugeot records will last long. 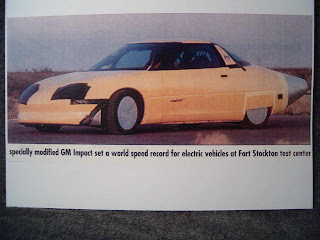 What really puts the limp wristed Peugeot performance into it's place is the record set back in 1994 by the GM Impact/EV1 prototype. Where the Peugeot EX1 with a gross weight of 750 kg recorded a top speed of only 87.6 mph over a mile (from a standing start), the EV1 with a slightly aero modified production chassis carrying 1573 kg still holds the FIA world speed record over a measured mile of 183 MPH.
" The speed records set simply don't show any relation to that kind of performance yet no one at Whatcar or Wired seems to have noticed. " Well - you and I noticed. You did the investigation (Thanks for digging out that the records were oooold) and I did the math. Conclusion : the speeds given are not the top speeds but the AVERAGE speed.